This article is the first in a series of three articles exploring worldwide perceptions of well-being in the five well-being elements of the Gallup-Healthways Global Well-Being Index: purpose, social, financial, community, and physical. WASHINGTON, D.C. -- One in six adults worldwide are considered thriving -- or strong and consistent -- in at least three of the five elements of well-being, as measured by the inaugural Gallup-Healthways Global Well-Being Index in 2013. Residents of the Americas region are the most likely to be thriving in three or more elements (33%), while those in sub-Saharan Africa are the least likely (9%). Each element of well-being is important on its own, but the elements are also interdependent and well-being is more than the sum of the elements. That only 17% of residents in the 135 countries and areas surveyed are thriving in three or more elements underscores how most of the world is struggling to achieve high well-being. More adults globally are thriving in community well-being (26%) than in any other element. Residents in the Americas region, with more than one in three (37%) thriving, are most likely to be thriving in this element. Adults in sub-Saharan Africa are the least likely to be thriving (18%). Fewer adults globally are thriving in purpose well-being than in any other element. Adults in Asia, as well as the Middle East and North Africa, are least likely to be thriving in this element (13% in each region), while those in the Americas again top the list of regions, at 37% thriving in purpose well-being. In analyzing the results of the index, Gallup classifies responses as "thriving" (well-being that is strong and consistent), "struggling" (well-being that is moderate or inconsistent), or "suffering" (well-being that is low and inconsistent). Adults in Latin America are most likely to be thriving in well-being in three or more elements as well as across elements. 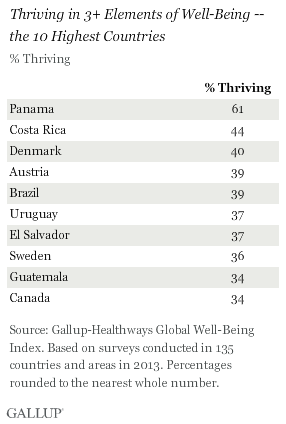 Latin Americans generally report higher levels of well-being than any other regional group. This is consistent with other Gallup World Poll research that shows residents of Latin America generally evaluating their lives more highly than those in other regional groups, partly reflecting a cultural tendency in the region to focus on the positives in life. Panama leads not only the region, but the world in four of the five well-being elements -- purpose, social, community, and physical well-being. Sixty-one percent of Panamanians are thriving in three or more elements, 17 percentage points ahead of its second-place neighbor, Costa Rica (44%). Panama's strong and growing economy, an unemployment rate of 4.5% in 2013, and national development may be the most significant factors contributing to its high thriving levels. Financial well-being is the only element in which other countries' residents top Panama's. Swedes lead the world in financial well-being, with 72% thriving. Financial well-being is high across a range of northern and central European countries, including Austria (64% thriving), Denmark (59%), and the Netherlands (56%). Only five countries outside of the Americas and Europe regions have levels of thriving within an element that rank in the top 10 of all countries -- Bahrain in financial well-being (48%), Saudi Arabia in community well-being (43%) and physical well-being (39%), Malta in social well-being (47%), and Sri Lanka (50%) and the United Arab Emirates (49%) in community well-being. No countries outside of these two regions finished in the top 10 in thriving in three or more elements. Adults in sub-Saharan Africa are the least likely to be thriving in three or more elements of well-being (9%), in addition to their low levels of financial well-being (9%), social well-being (16%), community well-being (18%), and physical well-being (20%). Democratic Republic of the Congo (DRC), Chad, Madagascar, Uganda, and Benin residents have some of the lowest levels of thriving in the world. Most of these countries are plagued by war, political turmoil, low levels of development, and endemic corruption. DRC, for example, has been embroiled in nearly continuous conflict since 1996, and is rife with political instability. Although subjective well-being is dire in many sub-Saharan African countries, the situation is worse in Afghanistan and Syria. In 2013, just 1% of Syrian and Afghan adults were thriving in three or more elements; the two nations share the lowest well-being of the 135 countries and areas in the 2013 survey. Both countries are conflict zones. By the end of 2013, the United Nations High Commissioner for Refugees estimated that 6.5 million of a total population of 22 million Syrians would need humanitarian aid, and 4.25 million of those would be internally displaced. Afghans are also awash in uncertainty about the country's future security situation and its relative stability once foreign aid and investments level off. In a 2013 Gallup World Poll survey, more Afghans said their standard of living was getting worse than in any year since 2008, and most Afghans (61%) said it was a bad time for them to find a job. Against this backdrop, Afghans are the most likely of any population in the world not to be thriving in any element of well-being (75%). Objective measures including GDP, life expectancy, and employment statistics are important and useful in assessing a country's "success," as are historical trends over time. However, the concept of subjective well-being encompasses the broader aspects of a life well-lived. Gallup and Healthways research has shown that people with higher well-being are healthier, more productive, and more resilient in the face of challenges such as unemployment. People with higher well-being bounce back faster, are better able to take care of their own basic needs, and feel better able to contribute to and support the success of their organizations, communities, or countries. Subjective well-being does not necessarily correlate with GDP, the presence of conflict, or other absolute indicators. Residents in poor countries may report that they have high well-being in certain well-being elements while those in wealthy countries may report that they have low well-being in particular elements. War-torn populations such as those in Syria may have extremely low well-being, but low levels are also found in countries that are relatively stable, such as Croatia and Italy. There are policy implications for country leadership, development organizations, employers, health insurers (private and governmental), and others in the well-being status of their constituents. For example, Mexico has relatively high physical well-being scores. However, the country overtook the U.S. in 2013 as the most obese country in the Western Hemisphere and grapples with a high rate of diabetes. Diabetes and heart disease are the two most common causes of death in Mexico. While the physical well-being element captures more than just obesity, the high scores on this element in Mexico reveal areas where education is needed to help the population become more aware of health and healthy behaviors, and make better choices. Because subjective well-being can correlate with outcomes such as healthcare costs, productivity, and business performance, world leaders should consider well-being, in addition to objective measures such as GDP, to provide a better picture of progress toward specific policy and development goals. 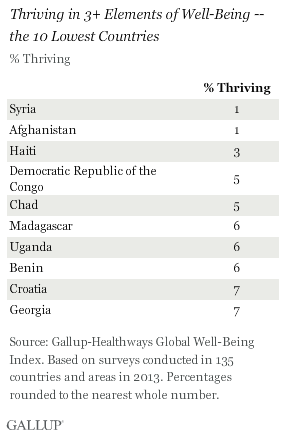 Access the full State of Global Well-Being report and 2013 data. Results for the Gallup-Healthways Global Well-Being Index are based on telephone and face-to-face interviews on the Gallup World Poll, with a random sample of approximately 133,000 adults, aged 15 and older, living in 135 countries and areas in 2013. For results based on the total sample of national adults, the margin of sampling error is less than ±1 percentage point at the 95% confidence level. For results based on country-level samples, the margin of error ranges from a low of ±2.1 to a high of ±5.3. All country-level analyses use country weights. Global and regional analysis uses projection weights that account for country size. Minimum sample sizes of N=300 apply. Copyright © 2008-2013 WB5, LLC. All rights reserved.